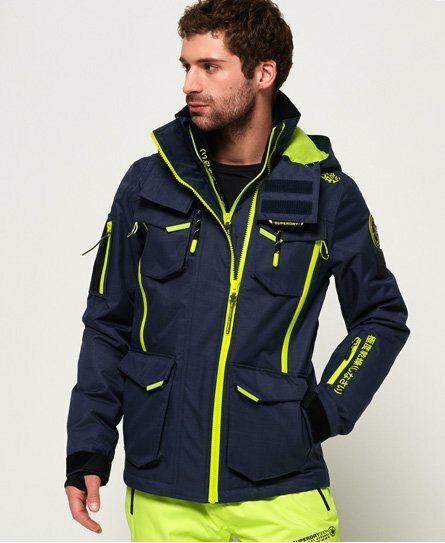 Superdry men’s Ultimate Snow Action jacket. Hit the slopes in style this season with our Ultimate Snow Action jacket. Featuring a hidden bungee cord adjuster on the hood, eight front pockets, a pocket on the sleeve made specifically for your ski pass and a pocket on the other arm. Inside, the jacket has a media pocket for your phone and a snow skirt. This jacket also has pit zip ventilation, for those warmer ski days, making it ideal to wear all season round. Finished with an array of Superdry Snow logos, this jacket is an essential for your snow wardrobe. Complete the outfit with brightly coloured salopettes to add a pop of colour to the look.